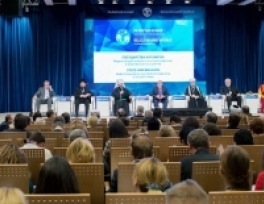 The first forum on "Religion and Peace" was held in the multimedia press center of RIA Novosti. 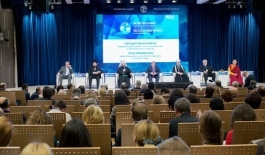 The main theme of the meeting was the "States and confessions: models of coexistence and interaction experience in the public space"
The forum was attended by over than 400 people, including the representatives of major traditional religions and experts in the field of interfaith relations of Russia , Europe and the United States. On behalf of the Chairman of the Council of Russian Muftis, Mufti Ravil Gaynutdin, the audience was greeted by his deputy Rushan Hazrat Abbyasov. The Chairman of the Russian Union of Evangelical Christians S.V. Ryahovsky also made a speech. Rabbi Aaron Gurevich, the head of the Department of the Federation of Jewish Communities of Russia on cooperation with the Armed Forces issued the appeal of the Chief Rabbi of Russia Berl Lazar. A representative of the head of the Buddhist Traditional Sangha of Russia Sanjay Lama Andrei Balzhirov also wished good on behalf of the pandito hambo Lama Damba Ayusheev. During the event, the Deputy Chairman of the Russian Muftis Council Rushan Abbasov said: "Three-quarters of the twentieth century, our nation has been under the rule of a totalitarian state, which attempted to create a new man and a new type of community - the "Soviet people." But the experiment has failed. The faith remained in the heart of people. The man has a need for service to God. Today, there are many atheists. Traditional religions can't use all their resources. We have no opportunity to cover all Muslims. We do not have enough mosques. Today people need to hear sermons of their spiritual mentors. We must combat against radicalism, some Muslims have become an easy target for extremists. It should to build new temples for different religions in Russia and particularly in Moscow that they will in a good neighborhood, as on Poklonnaya Gora. Then we will be able to withstand all threats." What Islam should exist in Russia?